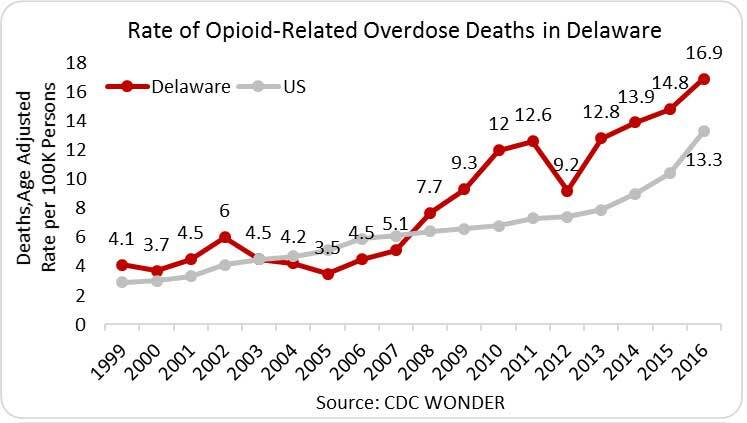 In 2016, there were 154 opioid-related overdose deaths­­­ in Delaware—a rate of 16.9 deaths per 100,000 persons and more than the national rate of 13.3 deaths per 100,000 persons. 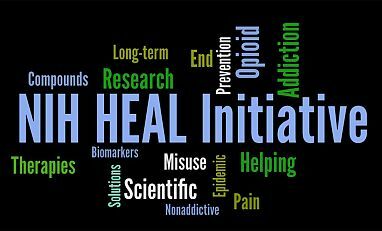 In 2015, providers in Delaware wrote 768,974 prescriptions for opioid pain relievers, or 80 prescriptions for every 100 persons. 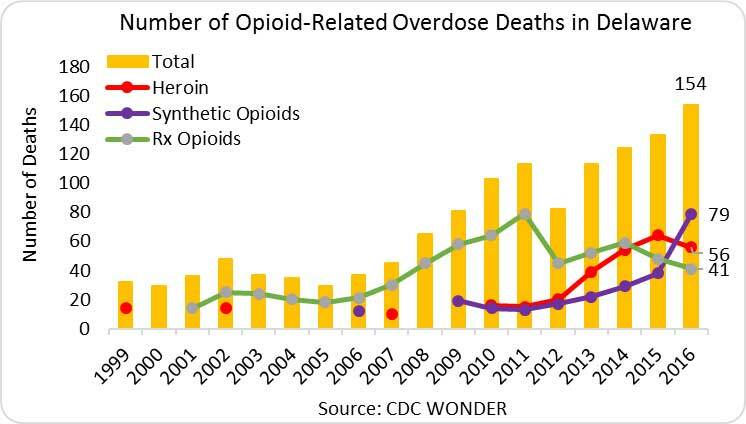 This was a 7.1 percent decline since 2013―compared to the average U.S. rate of 71 opioid prescriptions per 100 persons (IMS Health, 2016). According to hospital discharge data, during 2010 to 2013 in Delaware, 639 cases of NAS were identified with an incidence of 15.6 cases per 1,000 births. The incidence of NAS increased 56 percent, from 11.9 cases per 1,000 births in 2010 to 18.5 cases per 1,000 births in 2013. Delaware’s 2012 and 2013 NAS rates (17.8 and 18.5 cases per 1,000 births, respectively) were 3 times that of the 2012 average U.S. rate (5.8 cases per 1,000 births) (DE Health and Social Services). State Incidence: Of the new HIV cases in 2015, 109 occurred in Delaware, with 4.7 percent1 of new cases in males and 8.7 percent of new cases in females attributed to IDU (AIDSVu). State Prevalence: In 2014, an estimated 3,213 persons were living with a diagnosed HIV infection in Delaware—a rate of 407 per 100,000 persons. Of these, 25.7 percent1 of males and 26.3 percent of females were living with HIV attributed to IDU (AIDSVu). State Incidence: In 2015, Delaware reported 31 cases of chronic HCV and 4 cases of acute HCV (0.4 per 100,000 persons) (CDC). State Prevalence: Current state prevalence data are not available. As of 2010, an estimated 13,600 (1,970 per 100,000) persons were living with HCV in Delaware (HepVu).